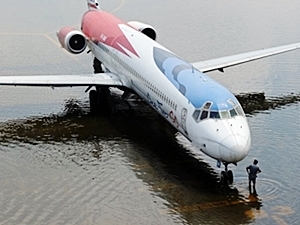 BANGKOK, Nov 29 – Restoration work at the recently submerged Don Mueang Airport has begun and is expected to be complete within three months, while the United States is dispatching both personnel and helicopters to join the operations. Thai government deputy spokesman Anusorn Eiamsaard said the Tuesday cabinet meeting acknowledged the assistance from the United States to provide 30 personnel, 30 helicopters, water pumps and other flood-related equipment to restore Don Mueang Airport from Nov 29 through Dec 4. Don Mueang Airport director Kantpat Mangalasiri said the floodwater on the eastern part of the runway already receded to the surface of the runway on some 700 metres of its full length of 3,500 metres. The dry runway is now being cleaned and the cleaning could be complete Dec 10 when the entire runway is expected to be dry again, Group Captain Kantpat said. He also urged those who parked cars at the airport before it was hit by flood to claim their vehicles, altogether around 7,000, while the airport will provide the necessary equipment to facilitate the transport of cars damaged by flood. The airport director said the rehabilitation will take 120 days within a budget of Bt1 billion.